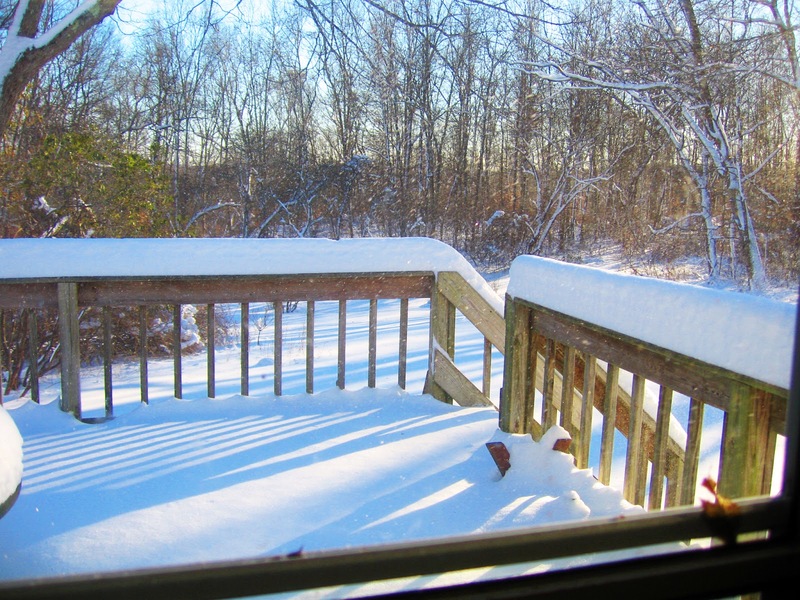 Gil, a long time reader and friend, sent me this picture of his backyard because he knew I was craving the sight of some snow. We're both on the east coast right now, but he's further north than we are and he got almost a foot of snow. I'm so jealous! The reason I used his picture is because as soon as I saw it, it remided me of my childhood. 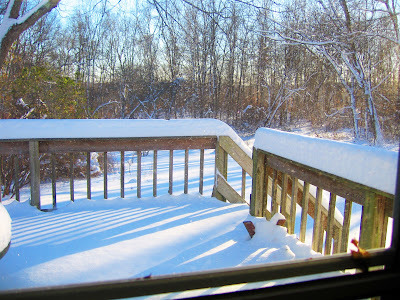 When we used to wake up in the morning to a big snow, and the railings on our porch looked just like this - covered with pristine, untouched, fluffy white snow. My brother and I couldn't wait to get out in a snow like this. And one of the first things we'd do is run our gloved hands over the entire railing, watching the snow flutter over our wrists and to the ground below. It's cold here in New Jersey and although there's no snow on the ground where we are, I'm loving the crisp winter air. This weekend we'll be heading to the Midwest where there will definitely be snow on the ground. Ed even joked about us going snow tubing. I love that idea. Can you see me, flying down the hill on a tube? The thought of it is comical. And even a bit preposterous. I probably won't allow any pictures to be taken. Anyway....I'm feeling good about the new year. I don't know what it is about the first day of the year, but it really does feel like a new beginning. Pure. Fresh. Bright. And fluffy. Like new snow. Salena, now that you've got your "snow fix". have you planned your ski trip?? I think you and ED would really enjoy it!! great, i hear theres a lot of snow in your area up in the mountains, do you have any local ski areas that you could try out?? best of luck and have lotsa fun..
forgot to mention that all ski areas offer a basic lesson and rentals, after your lesson they cut you loose and you have all the remainder of the day to go at it..
and don't forget about the night skiing, absolutely beautiful..